Lockport’s famous Flight of Five locks are perhaps one of the most iconic features and engineering feats of the entire Erie Canal. City planners, working with citizen's groups and canal champions developed a bold plan to restore the historic Flight of Five and make the locks a showpiece of a larger economic development plan. The Lockport Locks District is today the culmination of many years economic investment, historic preservation, and community revitalization centered around Lockport's iconic locks. The Lockport Locks District showcases the remarkable restoration of Locks 69 and 70, originally completed in 1849. 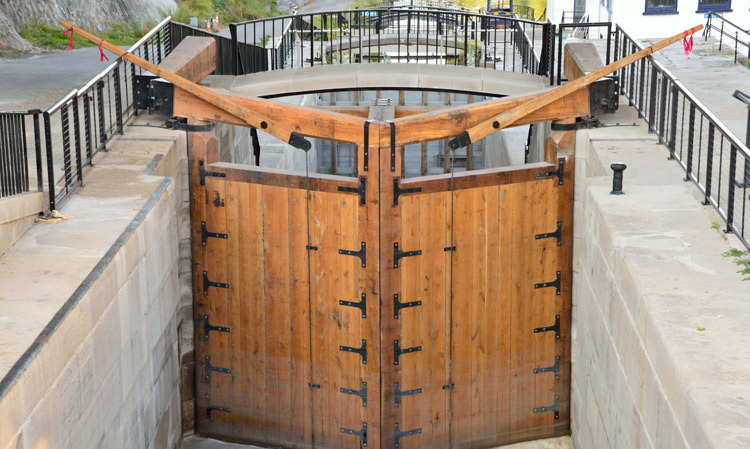 Visitors can see the locks massive wooden gates, operated by hand, next to Locks 34 and 35, which enable today's canal traffic to climb the Niagara Escarpment. Canal Street, a pedestrian and bicycle-only street overlooking the locks, anchors a number of events, businesses and attractions, including: the Erie Canal Discovery Center, Lake Effect Ice Cream, Flight of Five Winery, Lockport Caves and Underground Boat Rides, and a weekly Community Market. In addition, Harrison Place, an advanced manufacturing and entrepreneurship hub, Cornerstone CFCU Arena, a newly opened skating facility, and Lockport Locks and Erie Canal Cruises are important community assets within the District. Along with sites in Niagara Falls and Buffalo, Lockport’s canal-related attractions represent a significant cluster of outstanding heritage assets that make Western New York a tremendous destination for visitors… and a must-see destination within the Erie Canalway National Heritage Corridor. Making a all of these pieces come together has taken tremendous dedication, drive, planning, and, of course, money. Success on the ground is the result of well-planned investments that capitalize on Lockport’s canal heritage, as well as sustained collaboration among the City of Lockport, Greater Lockport Development Corporation, Lockport Heritage District Corporation, Niagara County Historical Society, Lockport Main Street Program, NYS Canal Corporation, and local businesses and residents. Start your visit to Lockport at the Erie Canal Discovery Center to learn about the locks and find out more about nearby tours and attractions.